EPCOT is probably the BEST Disney park in southern Florida! It holds the attention of every boy and girl, adult and child alike. There are so many things to do and see and lots of places to eat. If you ask our kids, they would say that EPCOT is their favorite park! Here are the highlights of our trip! In the World Showcase found around the lake in EPCOT, there are twelve different countries that offer authentic food. We had the chance to eat in Italy, France, Mexico, and Germany. The kids thought it was fun that the waiters and waitresses were actually from the various countries they represented. The food was excellent and reasonably priced for the most part. I think the kids’ favorite food was when we ate at the Parisian deli/bakery. How can you go wrong with chocolate and pastries? Sometimes, we bought about $20 worth of sweets and all six of us got full. Having picky eaters, I appreciated the fact that, for the not-so-adventurous kids, they served hamburgers, hot dogs, french fries, and other Americanized food. The kid’s menu items range from about $5-10. The French restaurant was a little more pricey but it was totally worth it. Some countries may be difficult to find seating unless you make a reservation. To keep the kids from getting too hungry but not too full before eating in one of the countries, we constantly found ourselves in Club Cool trying all sorts of flavors of coke products from all around the world. 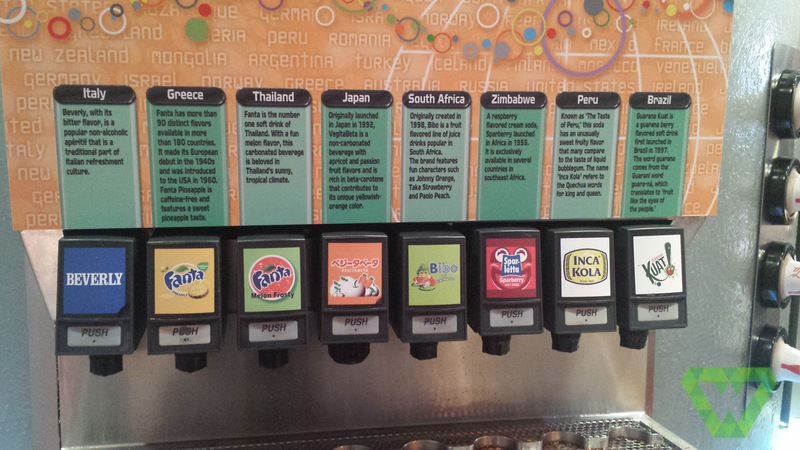 Our kids coined it “crazy soda”. They would often beg to go get crazy soda. There aren’t a ton of rides but they have some pretty popular ones: Test Track, Journey to Imagination, Mission Space, and Spaceship Earth. You’re going to usually have long stand-by lines at Mission Space and Test Track. If you’re looking for more calm rides, I recommend Ellen’s Engergy Adventure, Journey into Imagination with Figment, The Gran Fiesta Tour starring the Three Caballeros, and Spaceship Earth. The great thing about EPCOT is that in nearly every ride, you’re going to learn something while being entertained. The Seas with Nemo and Friends is also nice and slow. It’s similar to the Little Mermaid ride in Disneyland. Also, at the end, there’s a pretty cool aquarium. I was thoroughly surprised by the variety of marine life. The boys enjoyed watching the stingrays and turtles. They even have a diver demonstrate the proper pressurization and depressurization with the opportunity to see her/him in action. Afterwards, he/she offers time to take pictures with you and/or your kids. Our kids’ top favorites were Test Track, Journey to Imagination and Mission Space. Test Track gives you the opportunity to design your own car then test it out on an obstacle course of sorts and a race track. Mission Space is a simulator in which you can control a space shuttle and sends you through space. Journey to Imagination creates situations that tantalizes the senses as you journey with Figment. If you get the opportunity, take a look at Innoventions. There are a couple of simulators that you can do inside for a fee, but there are also some of the latest and greatest inventions on the market. It also includes weather simulations for kids that have no charge. It’s a great place to cool off and slow down… take a break from the crowds. The World Showcase is a pleasant change of pace with a variety of cultures and lifestyles. With shops, restaurants and live entertainment, you’re bound to find something of interest in the World Showcase. Each country is so ornate and detailed that it feels like you’re actually there. My favorite countries were France and China. The live entertainment and music in China was captivating. The food in France was delectable!!! Nearly every night, we actually found ourselves eating pastries in France. In the past few years, Phineas and Ferb’s pet platypus has become a huge hit in Disney. As a result, they have included Agent P’s World Showcase Adventure. This game is geared more toward older kids and adults. There are four stations to pick up an interactive handheld device and receive your mission. You can choose from seven different countries with different scenarios for each country. Your device will give you clues to solve the mission based on which country you are in. One mission will take about 15-20 minutes. The boys enjoyed it, but the girls liked it more. Fireworks has always been one of Disney’s signature features. In the middle of the lake surrounded by the World Showcase at EPCOT, Disney hosts a spectacular show full of fireworks, music, pyrotechnics. Each country is featured during the show and, well, it always leaves chill bumps on my arms. Be sure to secure a spot for the show a few minutes before the park closes. Meeting the Disney characters is always a treat! Character meet/greet lines can get long, so we recommend finding the characters that have no lines. It’s not a bad idea to get a fastpass for a meet/greet. Sometimes, depending on where you meet the character, it may require a fee. In any case, there are cast members assigned to taking pictures of you and your family with the characters. Be sure to give them your camera and they will even take some with your camera. If you purchase a memory maker, you get to keep every picture that’s taken, including in the other three parks. For more information about EPCOT and purchasing tickets or rides, visit them online at www.disneyworld.disney.go.com.